I want to show you one corner of our bedroom. It's still a work in process so you just get to see part of the corner. Over the past few weeks I've been finding special things that just fit this space. This corner has been a puzzle to me -- I didn't know what to put here since the hanging lamp is the central feature. I love the way it's coming together. I can't wait to finish this corner! Hopefully it won't be too long and you can see it all. Each piece in this corner is special to me. Let me tell you about each one. Not long ago I shared the old framed picture here. The plates are recent "finds". 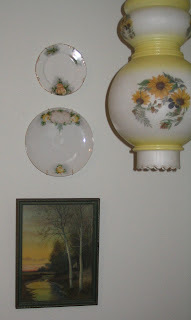 My dear mother and I were in the back corner of an antique mall a few miles from home when I found the large plate. It is Nippon china -- marked $2.00. The lady at the cash register was shocked at the price. 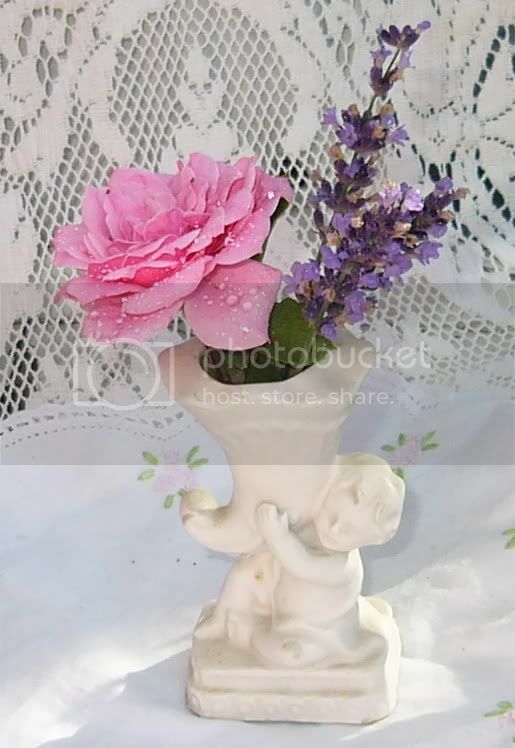 She said the seller is very knowledgeable and "knows his stuff" pretty well. She couldn't believe that he had mispriced this one. What was even more fun is that my dear mother found another Nippon plate in blues - same seller - for $2.00. As we drove away that day we knew we had each found a bargain! 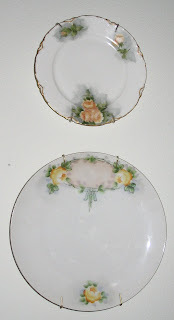 The little plate on the top was a thrift store find a few days later - signed Haviland china from France for 75 cents! This hanging lamp is especially dear to my heart. It was a special anniversary gift to me from my sweetheart at a time when my heart needed a lift. At the time my sweetheart was the pastor of a small church on the Oregon Coast. We had lived there for just a few months before our 4th wedding anniversary, January 1976. When we moved to town we rented a little cottage-type house while we looked at homes to buy. Before the holiday season we had begun the process to buy our own home. A few days before our anniversary the sale was completed and we were anxiously waiting to move in. Because our finances were tight we had decided not to give anniversary gifts to each other that year. Our gift to each other was our new home. We decided to buy a mattress set for our new bedroom and use the "old" one in our new guestroom so we shopped at a local furniture store during one of their big sales. While waiting for the saleman to help us I wandered through the lamp department and instantly fell in love with this beautiful yellow swag lamp. Swag lamps were all the rage at the time and I had never seen a yellow one with flowers on it. There was no way we could afford to buy the lamp but I told my sweetheart how I loved the lamp and wished I could buy it for our new bedroom. We bought a mattress set and left the store. I thought I would never see that lamp again so I tried not to think about it too much. Our anniversary is in the middle of January. At that time our church district conducted an annual retreat for all of the pastors and their wives. It was always a wonderful time of rest and refreshing and a time to meet new friends and renew old friendships with pastors and their wives from all over Oregon. The only problem was that it was held in the middle of January each year - our anniversary was always during the retreat. And - it was held at a mountain camp and retreat center owned by our church district. There were not enough rooms for all of the couples to stay together so the district officials got the private rooms. The rest of us stayed in the girls' dorms and the boys' dorms that were used for summer camps. Each year we knew that we would spend our anniversary in the mountains - in the snow - in separate dorms! We usually rode to the retreat with another pastor and his wife from our area to save expenses and have less cars in the small parking lot. In January, 1976 our anniversary was on the last day of the retreat. Shortly after breakfast we left to travel approximately 5 hours home. We rode with another couple so we spent those hours visiting with them. Not long after we got home we ate a hurried fast-food meal together with our young son and my sweetheart went to the church to conduct a wedding rehearsal. I remember that night as if it were yesterday! It was a very stormy, foggy night on the Oregon Coast and at times the wind howled around the corners of our little house. After our little boy was asleep in his bed upstairs I sat in my rocking chair in the corner of the living room and cried. I felt so sad that it was my anniversary and I was at home alone! I cried because we had been with people all day and now my sweetheart had quickly eaten and left to carry out his duties as the pastor of our church - and I felt so sad. Sometime later, after my tears had dried, my sweetheart came through the door with the biggest gift-wrapped box I think I had ever seen. He put it on my lap and said, "Happy Anniversary"! Of course I exclaimed and scolded because we had agreed NOT to give gifts to each other. At his urging I opened the box. What did my eyes see? It was the beautiful yellow swag lamp I had dreamed of a couple of weeks earlier. "How did you do this"? "When did you buy this"? He still recalls that I couldn't stop smiling. Again the tears flowed down my face. Not sad tears this time - they were tears of joy and love for this special man I had married just 4 years ago that day. 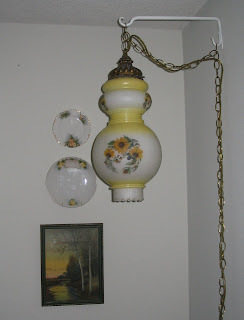 The lamp has hung in some other houses since the first home we owned in that town. It has been carefully packed and lovingly carried along to each place. When we moved into this house I thought there would be no way I could use my special lamp. As in many homes built in our town during the 1960's, our home has ceiling heat that radiates heat down into each room. Electric wires were wound back and forth all across the ceiling and covered by plaster. Because of that we can't put anything into the ceiling. You can see the solution I came up with so I could use my lamp. I hope you enjoy this little glimpse of my world and the story behind the special things in this corner of our room. You will see this again when the other parts of the corner have all come together. What alovely story Adrienne. I have recently gotten close to our pastors wife in our new church and realized that many people, myself included, really don't understand some of the hardships and expectations pastoral families go through because everyone feels that their church duties should come before family time. We all need to be so much more supportive of the family life of our pastors. I think a lace or even plain chain cover would be really pretty. What a sweet story! Beautiful lamp and dishes. I think a chain cover the same shade as the walls would be nice. That's a very sweet story and a very sweet lamp, no wonder you prize it so much. I enjoyed hearing about your special lamp.